The Dunn and Lewis Youth Development Foundation Ltd. represents a “National Model” for youth development – A new approach and a template to replicate in other regional centres around Australia. 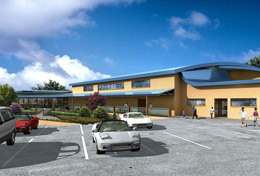 The Dunn Lewis Centre is a beautifully designed and appointed building that is the showcase of our community’s determination to assist our youth to achieve to their potential and to live their best lives; to have opportunities personally, socially and vocationally, building self-esteem thus aiding harm prevention and harm minimisation and well-being. The Dunn and Lewis Youth Development Foundation Ltd. (the Foundation) was established in 2003 by Ulladulla’s Gayle Dunn as a consequence of the death of her son Craig Dunn, his friend Danny Lewis and 86 other Australians in the Bali bombings of October 2002. 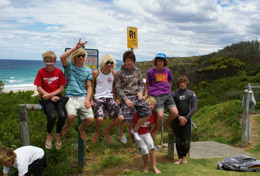 The Foundation is a not for profit youth and community support organisation created to serve the fast-growing NSW South Coast and surrounding regions. The Foundation has formed to fill a void that can become an overwhelming obstacle to many of today’s young people. The issues we confront here are not uncommon or special; in fact they are endemic in regional Australia. What help is there for young people who confront issues of trauma in their daily lives whether they are the result of violence, crime, personal tragedy, road accidents or isolation? There is also the ever increasing problem of unemployment which breeds a general indolence and feeling of worthlessness. A lack of community based activities, up-skilling programs and entertainment opportunities does nothing to deter or assist young people with binge drinking, drugs or address the overriding issues of boredom, lack of training or life guidance. This neglect fosters a downward spiral. The Foundation emerged through months of youth and community consultation. After four years of negotiating, research, collecting data and engaging experts in all areas, we have started building a multipurpose Youth Complex of world class standard at Ulladulla as the hub from which we will address these needs. The Complex will become self-funding, making it unique in Australia and a model to replicate in other regional centres. However, the brick and mortar structure is not all that the Foundation is about. In fact, it is supplementary to our main Mission, which is far more valuable than the facilities for physical enjoyment and social expression that are provided by the Complex itself. For the youth who are on the road to a healthy and successful life, the Complex will provide them with the facilities to excel and achieve the potential that already stirs within them. But for those who are not on the road to a successful life, the Foundation, which operates through the Complex, will provide them with so much more. Conventional programs often have limited success because they don’t place young people equal to or ahead of their peers when they complete the program. It’s proven fact that young people with some level of qualifications are much more likely to gain employment and have the confidence to continue with their education. This is a critical principle and is fundamental to the opportunities we plan to provide through the Complex. Our not for profit Foundation intends to practice self-reliance as well as preach it. We will use commercial activities to fund specialist youth support programs that will be our main work. In the initial development phase, our Foundation is relying on community businesses and government funding, donations and sponsorship to build the Complex and take it to the point where it can become self-funding for the long term.